Powerful pair of harmon/kardon speakers. A volume jog-dial worthy of its speakers. 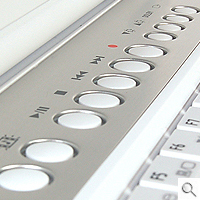 A comprehensive row of multimedia buttons. 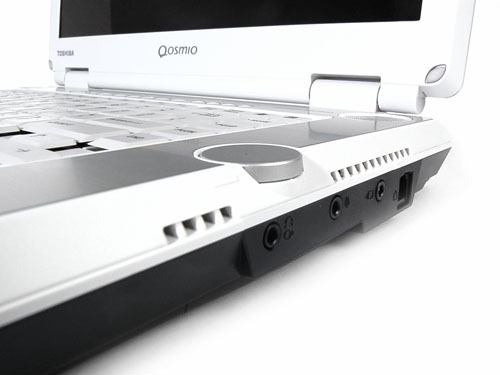 Toshiba has certainly been busy making waves with its Qosmio range of multimedia notebooks. 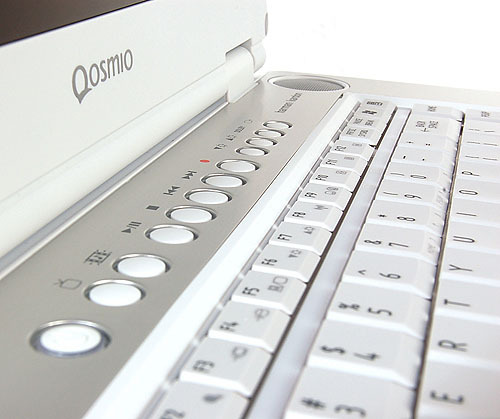 Little brother to the Qosmio G30 we looked at earlier this month, the new Qosmio F30 probably needs little introduction with regards to its capabilities as a notebook and as a portable entertainment deck. The F30 gleams pearly-white with a large presence that overshadows other gadgets set beside it. Its thick top can be explained by a brilliant high-luminance 15.4-inch glossy widescreen display with a native 1280 by 800 pixel resolution that delivers dazzling content even at a distance – absolutely spot-on considering movies should be enjoyed from a distant sofa or bed. A pair of eye-catching hardmon/kardon speakers complete with protective grilles provides the first hint of its multimedia prowess. When fired up, the two deceivingly small speakers instantly startled us; never had two tiny little speakers of such size created so much volume that was not only rich but surprisingly immersive as well. In fact, the loudness meant we had no choice but to carry out our usual multimedia tests of the notebook in an unoccupied area of the office. 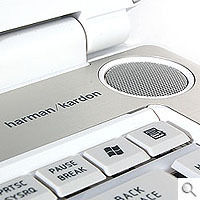 Knowing how loud the F30 can get, Toshiba has included a convenient jog-dial to facilitate quick adjustments of volume from loud to whisper quiet and vice-versa with a mere flick of the dial. One advantage the F30 has over its bigger G30 brother is the Microsoft Windows Media Centre Edition (MCE) operating system it carries as standard. 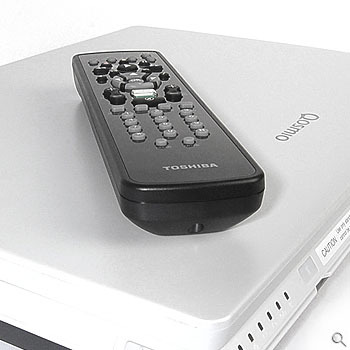 Also included to take advantage of the recording functions of the MCE operating system is an analogue TV-tuner as well as a full sized Toshiba remote control unit. One thing that was puzzling as it was unimpressive is the fact that an external infrared receiver had to be manually attached to the F30 before it could receive commands remotely, this when there is already an infrared receiver built right into the front panel. 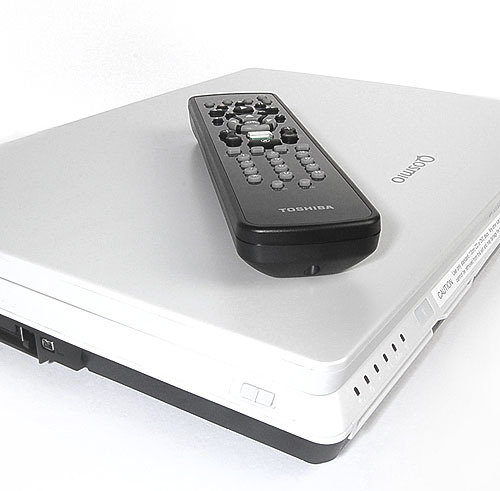 The F30 has a native multimedia mode that users may use to play DVDs and other media without having to run down the clock patiently for Windows to load up. All it takes is a simple push of the "TV" button on the remote control and the F30 will instantly spring to life while you're at a distance kicking back on your lazy chair. As per quality expected of Qosmio, the interface of the native multimedia mode is friendly and comes with a wide range of visual adjustments, but what really raised our eyebrows was the Window-less analogue video recording that essentially allows the F30 function like a traditional VCR. Gamers will be pleased to know that an Nvidia 7600 Go is on tap to power today's demanding games, but it is not just restricted to PC games, as the F30 can also be used as a television/VCR unit. 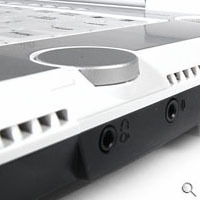 Through the onboard video-in (cable is supplied), console gamers can quickly pair the F30 with their consoles by powering the notebook in its native multimedia mode to utilize both the monitor for display and for recording of in-game scenes – perfect for taping down your record breaking laps, combo moves, and secret tricks to show off to your compatriots at a later time. As expected, battery life of the F30 was nothing to write home about. A DVD playback test with audio at 35% lasted only 96mins – not nearly enough to last through most DVD movies. However, despite the less then amazing battery life, we have to stress that the Qosmio wasn't designed for mobility but rather as an outstanding space-saving multimedia solution. Nevertheless, it's highly recommended that you remember to pack in the power brick should you decide to bring the Qosmio out with you. 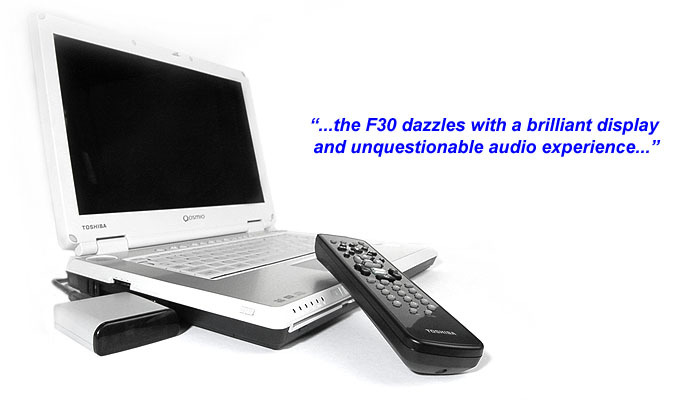 Shedding its bigger brother’s HD-DVD capability, the F30 is naturally tagged with a lower retail price. At USD$2,400, the F30 represents a quality, portable and yet fully capable multimedia solution that would be equally at home in your living room as it would be on your office table. For those who do not want to be embroiled in the ongoing optical format war, the F30 is hard to be ignored. Despite its notable weight of 3.8kg and short battery life, the F30 dazzles with a brilliant display and unquestionable audio experience. 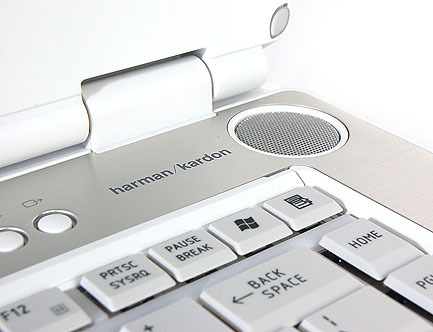 The euphoric multimedia experience for one is a tough act that few notebooks can match.